Quercetin is a flavonoid that is found in many fruits and vegetables, green tea and red wine. It is known for possessing potent antioxidants, which protect cells and DNA from free radical damage. Quercetin may also support cardiovascular health and respiratory health by helping to inhibit histamine release, among many other benefits. Unfortunately, it is not water soluble and has poor absorption. Enzymatically modified isoquercitrin (EMIQ) is a highly bioavailable, water-soluble form of quercetin that is manufactured through a natural enzymatic process. 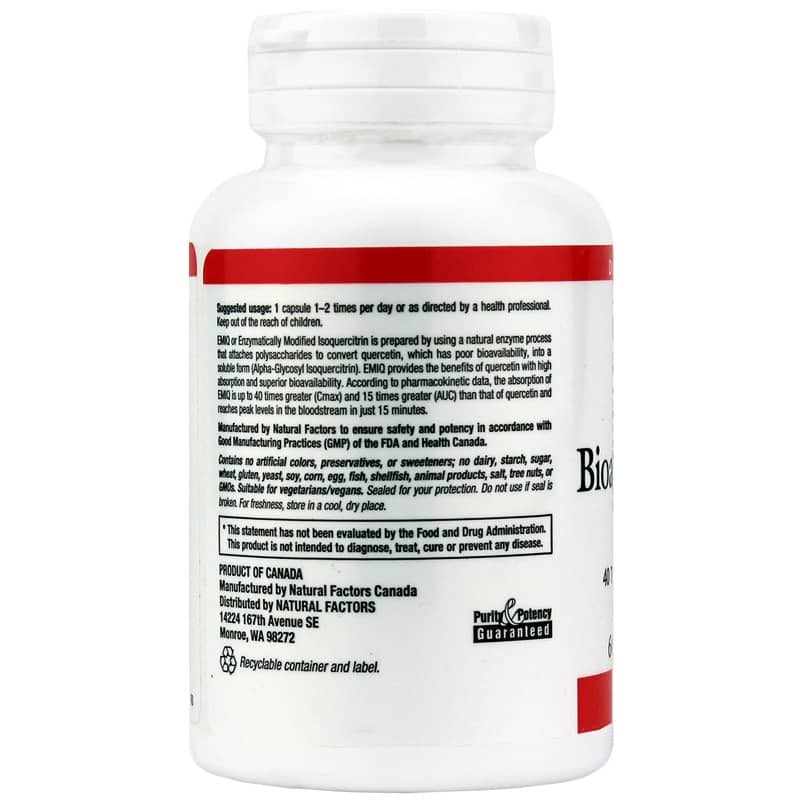 Natural Factors offers a natural antioxidant supplement called Bioactive Quercetin EMIQ that delivers up to 40 times greater absorption than regular quercetin. 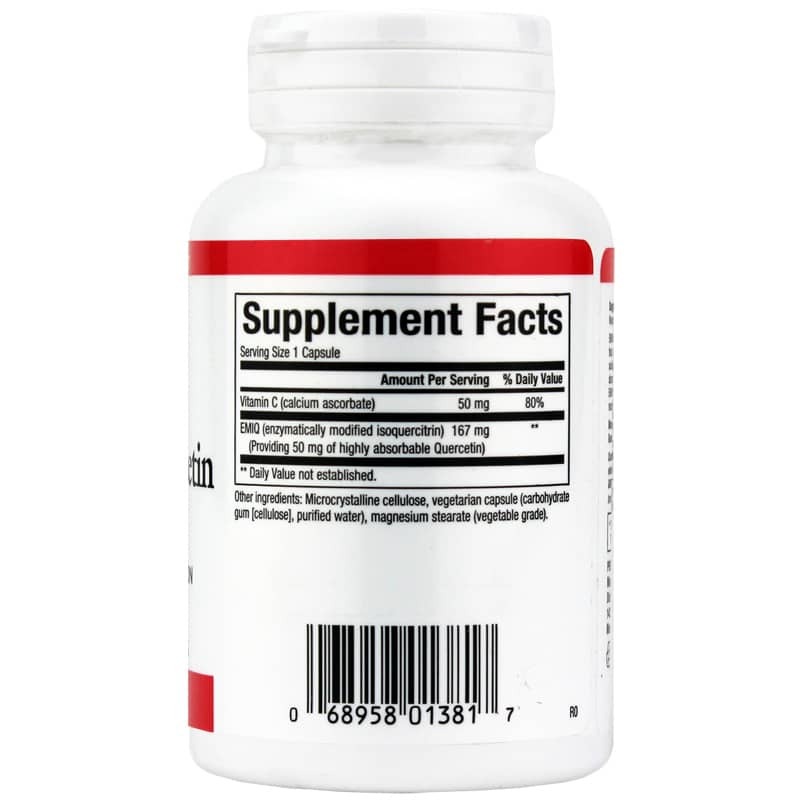 This supplement does not contain fish, shellfish or animal products, artificial colors, preservatives or sweeteners, GMOs, dairy, starch, sugar, wheat, gluten, yeast, soy, egg, salt or tree nuts. It is manufactured in accordance with Good Manufacturing Practices (GMP). 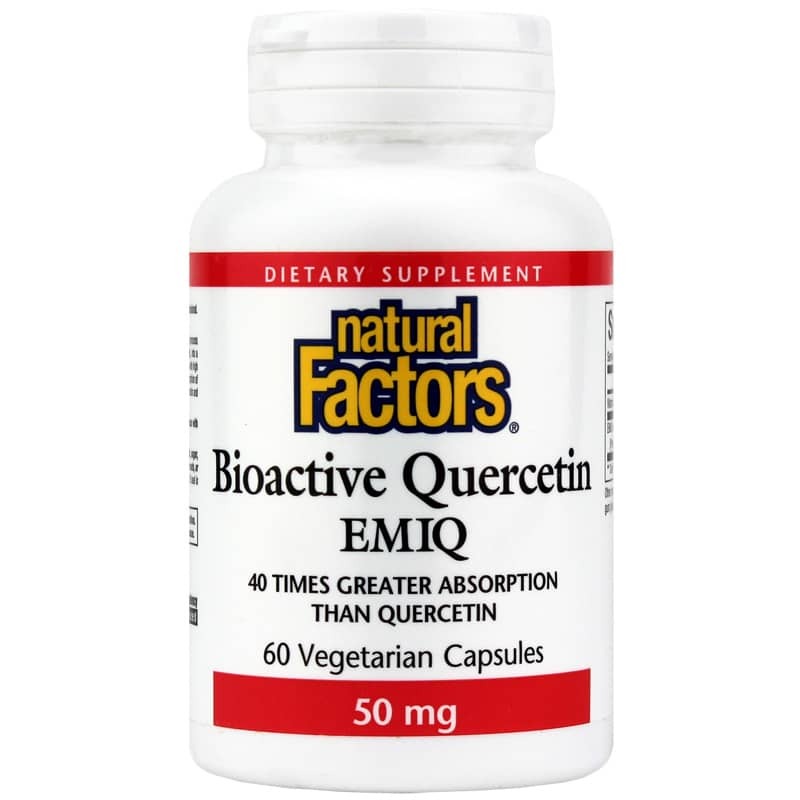 If you're looking for a natural antioxidant supplement that may help control allergy symptoms, check into Natural Factors' Bioactive Quercetin EMIQ. Order online today! Other Ingredients: microcrystalline cellulose, vegetarian capsule (carbohydrate gum [cellulose], purified water), magnesium stearate (vegetable grade). Contains NO: dairy, starch, sugar, wheat, gluten, yeast, soy, corn, egg, fish, shellfish, animal products, salt, tree nuts, GMOs, artificial colors, preservatives or sweeteners. Adults: 1 capsule, 1 to 2 times per day or as directed by a health professional.